Yale Broadcast Studio, located at 135 College Street, has completed renovations on a new control room to increase the production capacity of its video studios, improve the workflow of the broadcast staff, and introduce new technology at the Studio. Rick Leone, Director of Yale Broadcast Studio, oversaw the renovation while ensuring that the Studio remained operational. Leone says the renovation was needed to meet the demands placed on the Studio as Yale continues to rely on audio and visual content for a multitude of projects. Leone and the Studio’s staff have worked with many faculty members, students, and alumni, including Secretary of State Hilary Clinton, actor Paul Giamatti, and actress Meryl Streep. Yale Broadcast Studio worked diligently to relocate the audio recording studio into two previous editing suites and to repurpose a former office into much-needed storage space. The audio recording studio is essential for Yale community members to produce weekly podcasts, to take part in radio talk-show programs as guests, and to create voice-over recordings. The relocation of the audio recording studio made space available for the new control room. Leone is excited to use the new control room, and the new equipment within the room, to successfully produce more materials for Yale faculty. The renovations at the Studio will help the staff uphold their mission to help Yale faculty members, researchers, administrators, and other community members by facilitating their participation in the global media dialog on issues of great societal importance and by supporting the production of video content for Yale’s MOOCs. 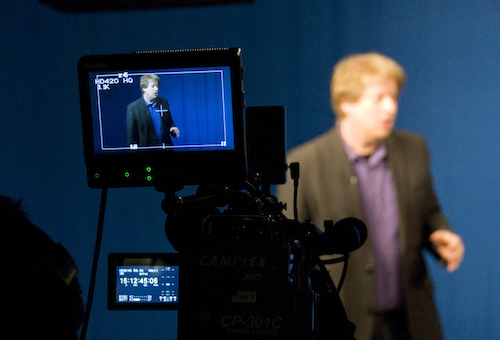 For more information about Yale Broadcast Studio, please visit broadcast.yale.edu.